Uttarakhand Floods: A Disaster of Our Own Making? Floods in India have killed thousands, sending a sobering message about the risks of rapid development. Even after two weeks of rescue operations uncertainty prevails over the number of casualties and people still stuck in what is described as the worst natural disaster that has ever struck the northern Indian state of Uttarakhand. The Chief Minister of the mountainous state, Vijay Bahuguna, says that the exact number of deaths in the calamity will never be known as estimates of the actual casualties vary from hundreds to several thousands. One senior official claims that the death toll could exceed 10,000. According to state officials, 3,000 people are still missing from the region. Most of the victims identified so far have been outsiders who were on the Char Dham Yatra pilgrimage to Uttarkhand’s shrines of Badrinath, Kedarnath, Gangotri and Yamnotri, which takes place between May and November. This is one of the reasons that the tragedy in the tiny state has impacted the whole nation. During peak season every year hordes of pilgrims come from across India and abroad to visit hilly pilgrimage centers accessible only by small roads, which believers travel with the help of mules. For Hindus, the journey to the four shrines carries a similar level of importance as Haj does for Muslims. The inaccessibility of the terrain and breakdown in communication made it difficult to assess the enormity of the damage in the first few days after incessant rain started on June 16. Subsequent cloudbursts wiped out town after town and ravaged hundreds of villages. Reports coming from the state narrate the bone chilling stories of eye witness accounts, detailing three days of unprecedented devastation that claimed an untold number of lives. At the center of the hardest hit area was the temple town of Kedarnath, 11,000 feet above sea level. News reports suggest that at least 10,000 to 12,000 people visit the hilly town every day during the peak pilgrimage season. The latest figures released by the Uttarakhand government indicated that 2,375 villages were affected by floods and landslides, of which 739 are still cut off, but are receiving relief supplies. Based on first-hand information, Palijor said that hundreds of villages lying on both sides of the Bhagirathi and Alaknanda rivers have been all but washed off the map, with little hope of rehabilitation. It will take between weeks and months until rescue operations are completed, and years before the state can be rebuilt. 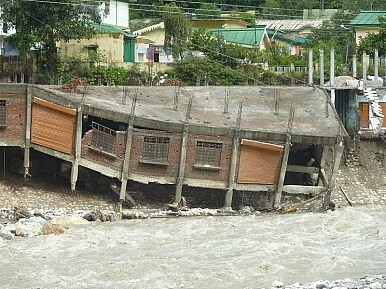 Uttarakhand has been at the receiving end of nature’s fury in recent years. In 2008-2009, the state experienced severe drought. And in 2010, people grappled with floods, flash floods, landslides and cloudbursts. But the severity of the tragedy hitting the state this time has raised some very valid questions: How much of the devastation is the result of climate change? And to what it extent was it induced by unplanned development by the state? In short, the indiscriminate increase in tourism wreaked havoc on the environmentally vulnerable state. According to the 2011 census, Uttarakhand’s population was 10.8 million. The state hosted 20.68 million pilgrims and tourists in 2010-2011. Since then, the four pilgrimage centers saw a fourfold increase in the number of pilgrims as year-round access to the shrines – previously restricted to four months – was allowed. News magazine Tehelka writes that, according to the state official in charge of monitoring vehicles, around 100,000 vehicles – 50-60 percent of them not state-owned – visit the pilgrimage centers three times each year. Further, since 2005-2006, the number of registered taxis and jeeps in the state has jumped tenfold. Meanwhile, since 2010, the state has built an additional 4,500 km of road, and has nearly tripled its total road length in the past decade. Taking a cue from the recent tragedy, on Monday the state government announced that construction will no longer be allowed on the state’s river banks. Further, CM Bahuguna announced the establishment of a state Rehabilitation and Reconstruction Authority, which will draft plans to rebuild and develop the flood-hit areas of the state. But before rehabilitation starts the greater challenge for the state and the Indian government is finding the missing persons who number in the thousands. The tragic floods of Uttarakhand are a warning to all hilly states in India to stop playing with nature in the name of economic development. The first step toward preventing next year’s deadly flood: enforcing disaster management laws that already exist. Anatomy of India's Early 2017 State Assembly ElectionsLessons From India’s Election for the Evolution of the Indian Political SystemIndia's Early 2017 State Elections: What You Need to KnowPakistan’s Economic Woes: The Way ForwardIndian Elections 2019: Do Narendra Modi and the BJP Deserve a Second Term?